Named Antarctic Endurance at a ceremony in Ålesund, Norway, Aker BioMarine’s one of a kind, energy efficient krill harvesting vessel showcases the very best of Norwegian maritime engineering expertise and innovation. 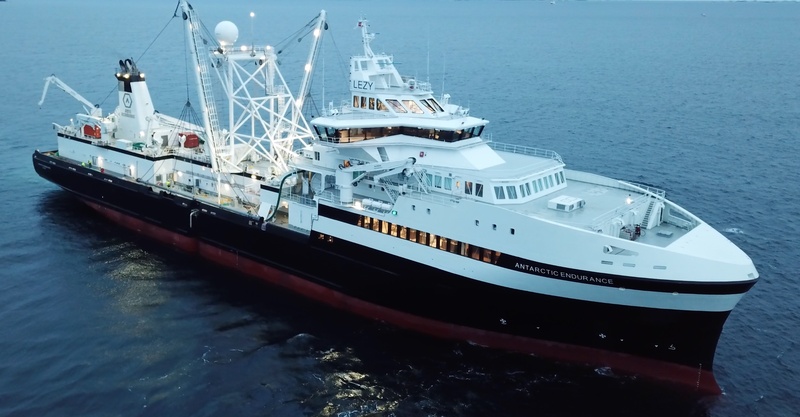 With a total of 40 Norwegian vendors contributing to the vessel, the two-year build and final fit-out has kept in excess of 900 people busy working to have the vessel ready for the 2019 harvesting season. Matts Johansen, CEO Aker BioMarine says, “We have put all our experience and know-how into building a vessel capable of matching our ambitions and operational needs, a vessel we could have only dreamt of when we started our very own Antarctic adventure for more than a decade ago”. Adding, “Named in tribute to polar explorer Sir Ernest Shackleton’s Norwegian-constructed vessel, Endurance, the name also reflects our own perseverance over the years. Energy efficient and equipped with a host of environmentally friendly technologies, Antarctic Endurance is specifically designed and constructed for our unique business, with direct input from our experienced crew. It is truly one of a kind, and our very first purpose-built krill harvesting vessel”. She says, “It is an incredible day for me to see my grandfather and his crew’s heroism honored in this way. Antarctic Endurance is a symbol and reminder of the importance of our shared polar expedition legacy and an important part of the history for both Norway and The United Kingdom. My grandfather Sir Ernest Shackleton had his vessel, Endurance, built in Sandefjord in Norway and now a new vessel named Endurance built in Norway is on its way to Antarctica”. The 130-meter, Norwegian flagged vessel is constructed at a cost of 1,1 billion NOK, or just over 140 million USD, and showcases the strength in-depth of Norway’s maritime cluster. Yard director Fredrik Mordal Hessen from Vard Brattvaag says, “We are incredibly happy to see Antarctic Endurance set sail from our yard for its debut harvesting season. A unique project, in partnership with Aker BioMarine we have overcome a number of challenges to deliver what we believe is an industry defining vessel”. Along with reflecting the core operational needs of our business, the new vessel has been meticulously designed and equipped to maximize energy efficiency. Utilizing a number of innovative processes and technologies onboard, the vessel is 30 percent more environmentally efficient, compared to today's trawlers.